Frank Zappa asked the question in 1986, “Does Humour Belong In Music?” I don’t know if that was a rhetorical question or not, but to head uncertainty off at the pass, the answer is yes. Flight of the Conchords and the national treasure (TM John Peel) that is Half Man Half Biscuit, are just two that justify an affirmative answer to that question. That said, Weird Al Jankovic and Tenacious D also make ‘humorous’ music but, to compare such acts to The Burning Hell, is to compare Cannon & Ball to Stewart Lee, so, like music of any genre, there’s some good and there’s some not so good. 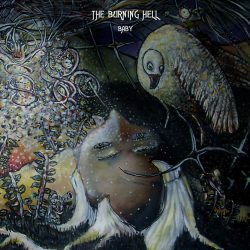 The Burning Hell make humorous music, but not like Weird Al or Tenacious D, and that’s not because they don’t parody soft targets or make gonzo rock music, but because they make literate, erudite and thought-provoking music which is frequently hilarious and more often than not, wryly amusing. Ostensibly the vehicle for Mathias Kom’s wordy wordplay and general melancholia and delight, what is now a trio or quintet, was back then an apparent free-for-all ‘Baby’ appears to have a musician count approximately the the population of Iceland. Lovingly re-released to mark its 10 year birthday, some tracks from Baby are still staples of their live shows today, Tracks such as the hilariously miserable ‘Everything Will Probably Be OK’ and ‘The Berlin Conference’, and while a fine album in its own right, it’s also an interesting pointer to where Kom’s writing was heading, namely the peerless material displayed on their more recent albums such as “People”, “Public Library” and last year’s “Revival Beach”. There are few if any acts creating what Kom and his band are creating. The promise shown with Baby has been realised in the decade following it. If you’re not familiar already, familiarise yourself.